Reception to follow. Free and open to the public. Since the early 1980s, two great cycles of change have unfolded in health care-each one set off by rising costs and punctuated by national political conflict. The next phase is taking shape now. Paul Starr, PhD is professor of sociology and public affairs at Princeton University and Stuart Professor of communications and public affairs at Princeton's Woodrow Wilson School. He has written three books about health care institutions and policies. The Social Transformation of American Medicine, updated in 2017, won the Bancroft Prize, C. Wright Mills Award, and Pulitzer Prize. Professor Starr served as a senior health policy advisor at the White House under President Clinton. 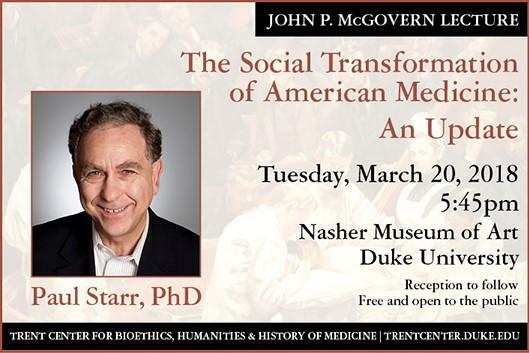 This lecture is made possible by the John P. McGovern, MD Endowment Fund. The McGovern Prize is awarded to an individual for outstanding contributions to the Art & Science of Medicine.